The Atrix HD came out in 2012, right before Motorola's Google-fueled turnaround. That's why it was surprising when Motorola put this phone on the KitKat update list in late 2013. That update never came through, leaving the device on Android 4.1.1, but Motorola is offering a deal on a new Moto X to make up for that. Anyone who still owns an Atrix HD can get $100 off the price of an unlocked Moto X Pure Edition. That means $399 plus tax and shipping if you want the plastic back. Wood and leather add $25 to the price. Also on the discount rack is the Motorola Whisper Bluetooth headset for $49.99 (usually $150). Motorola says Atrix HD people can also have the Tracks Air by Sol Republic X wireless headphones for $99.95 ($200 full price), but they are already on sale via Motorola's website for $74.95. So... I guess Atrix HD owners have to pay more? Talk about adding insult to injury. Ignoring the headphone gaffe, the Moto X deal isn't bad for a three year old phone that was released before a major upheaval in the company. To claim the discounts, you need to provide your name, email, IMEI number of the phone, and either the last four digits of the phone number or the phone's serial number. 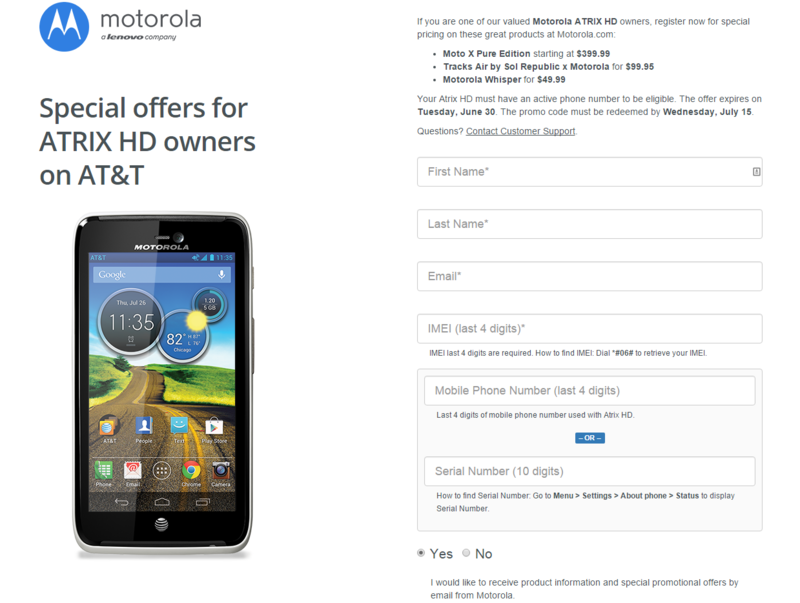 The page says only devices with active AT&T numbers are eligible, but I'm not sure how they would know.